The Weather Channel's "The Climate Code" covered in-depth The SustainLane US City Rankings yesterday, featuring reports from the top ten cities out of the largest 50 US cities SustainLane ranked in 2006. Look for How Green is Your City? The SustainLane US City Rankings from New Society Press in April with expanded and updated information on the rankings. Portland provides a great example of what cities, citizens and businesses can do together to improve their quality of life along with the local economy. 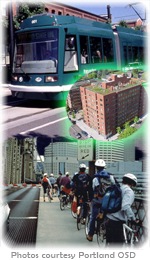 Once having some of the nation's poorest air quality, Portland now has some of the best air and tap water quality nationwide, along with free public transit downtown, the highest bike-to-work rate, the most LEED-certified buildings, strong local food and an emerging alternative fuels economy. Plus the real estate community has backed the first residential home multiple-listing service with green features in history. 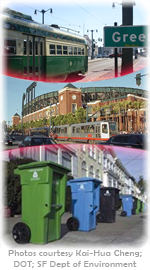 San Francisco is a close competitor with Portland for managing sustainability programs that help provide the nation's best solid waste diversion rate (recycling and commercial composting), and feature bold projects for solar and tidal energy generation. San Francisco's housing affordability remains an issue that forces many to commute long distances into the city. Fortunately the Bay Area features strong public transportation to help make that commuting less polluting and congested. Mayor Greg Nickels, who appeared on "The Climate Code," is a strong national advocate for climate change policy, clean technologies, green building and effective sustainability policy management. Seattle, its port authority and King County, have been teaming up on biodiesel ferry and bus initiatives, while the city has strongly pushed for restoring native forests in the Emerald City. My hometown, and each time I visit, I'm more wowed by what I see under Mayor Daley's leadership. Mayor Daley, who spoke on "The Climate Code" about wanting to go from #4 in the SustainLane rankings to #1, has been greening streets, freeways and even abandoned industrial sites. Chicago blends the aesthetic with the technical aspects of sustainability: the world's largest green roof at Millennium Park underlies a Frank Gehry-designed bandshell, all part of an ongoing study to reduce urban heat-island effect. Oakland is a great "sleeper" in the top ten, with growing public transit use, policy supporting more local food, renewable energy and a move toward energy security. 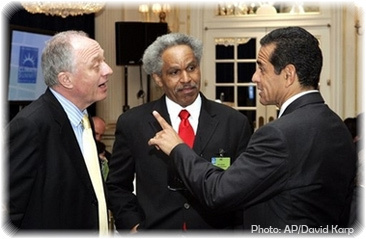 New Mayor Ron Dellums is instituting a "green collar" jobs program for youth and low-income workers, so that the clean tech jobs the city is trying to lure can equally benefit professionals, skilled people in the trades, unskilled workers and students. With the country's best urban public transit system, New York is not resting on its laurels. Mayor Bloomberg is putting his weight behind city appointments, committees and processes that are making a sustainability plan a reality in 2007. Out of such activities, look for the city to assume a leadership role in developing alternative fueled vehicles, renewable energy (including tidal) and Gotham-scaled green buildings. The Bean goes Green. Boston is poised to become the leading city for green building with its new zoning requiring that all buildings over 50,000 sq. feet be LEED (the US Green Building Council's Leadership in Energy and Environmental Design) certified. Add that to high renewable energy use, great public transit, walkability and low sprawl, and you get a promising future. Weakness: recycling. Philly's #8 has been a surprise to some, but the city is a great model for local urban food, with strong networks of farmers markets and community gardens. The city also is riding a wave of interest in sustainability from citizen groups, business (including the local Business Alliance for Local Living Economies), and just plain folks who have been attending large planning and visioning meetings. From that process the city needs a sustainability plan that city officials buy into, along with more recycling and renewable energy. When cities claim that they can't build public transit like that of such "older cities" in the top ten, I always point to Denver. The city and 30 surrounding towns in 2004 passed a ballot measure to build out more than 100 miles of new light rail and other new public transit lines. Mayor Hickenlooper has made sustainability the foundation for the city's future, through economic development that will be integrated with the new public transit. The skinny: 4x current public transit ridership in 15 years and a vital new American city. Minneapolis wants to increase its energy and food security, as Mayor R.T. Rybak described on "The Climate Code" yesterday. The city will continue being the leader in renewable energy for Midwestern cities, while bolstering farmers markets and community gardens (it's already #1 in that area), and green building. Before the holidays, one more very significant 2006 development in city greening and local economic development. "High performance buildings are the future," Mayor Thomas Menino told a gathering Tuesday at the Boston Redevelopment Agency, according to a statement issued by his office. The same statement cited SustainLane's US City Rankings study. Boston ranked #7 overall out of the nation's largest 50 cities in the SustainLane US City Rankings, with the city also finishing 7th in LEED buildings per capita. 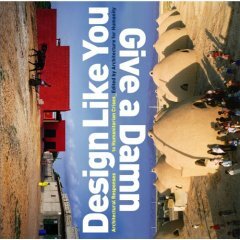 In Spring 2007, New Society Press will publish How Green Is Your City? The SustainLane US City Rankings, which details how Boston and 49 other US cities performed in green buildings per capita and other green indicator, management and economic categories. Mayor Menino announced the program Tuesday along with Jim Hunt, Director of the Boston Office of Environmental and Energy Services. The new requirements stipulates that as part of the city's development design review process all buildings over 50,000 square feet will need to meet the basic LEED certified level. LEED also awards silver, gold and platinum standards for commercial and government buildings. A LEED residential program is being launched, as is a LEED zoning development called LEED-ND, for "Neighborhood Development," a joint project of the US GBC, The Congress for New Urbanism, and the Natural Resources Defense Council. Stay tuned here next week for the Top Ten stories in state and local government sustainability policy, programs and events! Portland (Oregon) has done it again. The number-one city in SustainLane's US City Rankings will become next year the first U.S. city to make green home features such as LEED or Energy Star accreditation show up in the city's real estate multiple listing service (MLS). As anyone who has bought real estate knows, the MLS format is a standardized template--the green MLS in Portland could well become a standard for such listing services across the nation, particularly in areas where there is adequate supply and demand for green features. I met the person who was largely responsible for this further mainstreaming of the green building movement, Kria Lacher, with Meadows Group Realtors. In June, Lacher came to the SustainLane event we had awarding Portland as the most sustainable U.S. city and she described to me then how she was trying to make the green MLS happen in the area since last year. She told me today that come 2007 the MLS listing will have a pull-down menu for new homes that meet third-party green certification standards including the U.S. Green Building Council's LEED (Leadership in Energy and Environmental Design), the US EPA's Energy Star, and Earth Advantage, one of 65 regional or local green building standards in the U.S., according to Larcher. The Portland metro area MLS will also include standalone criteria search options for existing homes such as high-efficiency furnaces, off-grid or supplemental solar energy systems, and solar water heaters. Portland's metro extends into neighboring Washington State's Vancouver area. Most of the homes Lacher handles either have green features, are close to public transit, or are good candidates for solar energy and other green building systems. Lacher refuses to rest on her laurels--"I'm just getting started," she said. "The next opportunity is to convince banks to make loans that take into account life-cycle cost savings for homeowners that result directly from green building features."